What is your full Sister name? Date you joined the order? I started my journey on July 18, 2010 as a founding member of The Tri-City Sisters in Eastern WA. Unfortunately, The Tri-City Sisters are no more, but I was welcomed as a Novice Sister with The Portland Sisters of Perpetual Indulgence: Order of Benevolent Bliss in February of 2012 and I became a Fully Professed Sister on February 24, 2013. What is your lay occupation? There's a Registered Nurse somewhere beneath all of this makeup and sparkles. I was born on the 12th. The armpit of WA state. 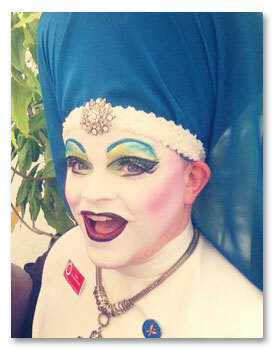 I went to San Francisco Pride in 2009 and attended an event called "A Night of Ritual Mayhem with the Sisters of Perpetual Indulgence." This event exposed me to the commitment the Sisters have for their community and one another. I was especially moved by a blessing of the attendees by Sister Mary Timothy Simplicity, who is the first nun I ever approached, hugged, and had my photo taken with. I knew that after that event that I'd someday become a Sister. Big Sister/Mother in the order? My mother in the Order of Benevolent Bliss is Sister Helen Baak. Also, Sister Mary Timothy Simplicity of San Francisco has been integral to my journey as a Sister and we've forged a long distance mother/daughter bond throughout the entire time I've been involved with the Sisters. I grew up in, and still live in a conservative area of WA state where the stigmatic guilt towards the LGBT community thrives. As a gay man in that environment, I've never felt like I could be my true self without somebody passing judgement. It remains a struggle to this day, at times. My basic job as a nun is to promulgate omniversal joy and expiate stigmatic guilt. The Sisters let me believe that I should be proud of who I am no matter what anyone else may tell me. It's hard for me to explain what a gift it was to be released from all of the shame-based guilt that has built up inside of me over the years, but it's easy to know that I want to share that gift with others who feel the same way that I did. I believe there is something Divine about the human condition and I believe in being a good person. Major projects with the Order? My Novice Project was the creation of a Media Kit for the Order of Benevolent Bliss to use when interacting with the press or establishing relationships with new business contacts. Other People's Words That I Find Instructive. We are proud to have PQ Monthly as our exclusive media partner. © 2013 Order of Benevolent Bliss, Inc. The Order of Benevolent Bliss, Inc. is a 501(C)3 non-profit corporation in the state of Oregon.